Ma Chunji, Chairman of Sinotruk (Hong Kong) Limited, visited Polish ZASADA Group from 21st to 23rd of September. As one of the biggest controlling Groups in Poland, ZASADA Group have four business sectors of automotive, real estate, manufacturing and leisure clothing, and there are more than 20 subsidiaries under it. During the visit, Mr. Ma had meeting with Mr. Piskorz - president of ZASADA group, Mr. Gaik - Ex-Minister of Industry of Poland (now he is the consultant of ZASADA) and the top management team of ZASADA group to discuss the cooperation projects, and signed a MOU. 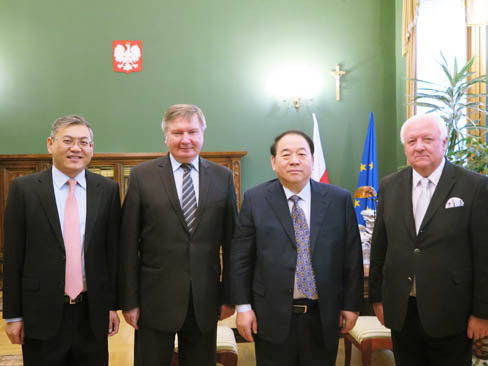 Accompanied by the top management team of ZASADA Group, Mr. Ma visited the Mr. Miller, Governor of województwo wielkopolskie. Mr. Ma was warmly welcomed by Mr. Miller, and Mr. Miller introduced the local political and economic environment, and related preferential policies for drawing foreign capital & business of the local government. Mr. Miller expressed that he will positively support the cooperation between Sinotruk and ZASADA Group.